From the very beginning of our company, it has been our mission to provide the best experience for our customers when they visit Seattle. Our signature walking tour has received rave reviews on Tripadvisor.com, been written about in the local and national press and even been featured on TV with Seattle’s Evening Magazine and MyFox. 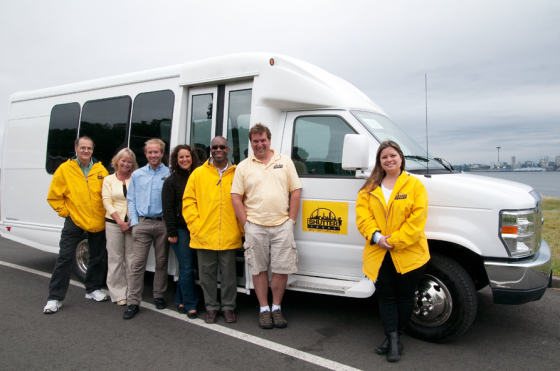 We knew we had to expand and provide an even greater experience by providing a driving tour. This week we picked up our brand new 14 passenger shuttle bus from the dealer. We are all thrilled that we will be able to offer some exciting new tours that we have have been working on in anticipation of this purchase. During the past two months, we have created an extended tour to Snoqualmie Falls and other excellent locations in the area. There are many more tours on the horizon, and we can now customize tours to take our tour participants to the locations they want to see most. Please email us with any tours you would like to see on our schedule at info@shuttertours.com.